MSV: Why the revolution will not be televised? Why the revolution will not be televised? It's that time of year when we reflect with gratitude and give thanks but this year there will be no annual Hoboken Housing Authority Thanksgiving Dinner. The annual (privately sponsored) dinner, the creation of HHA commissioner Jake Stuiver back in 2009 ran into some political problems. Currently, the former HHA Chairman is embroiled in a bizarre civil lawsuit claiming "ethnic cleansing" by HHA Executive Director Carmelo Garcia. As a result, the dinner has been unceremoniously cancelled. Stuiver founded the HHA dinner and insured the success of the event putting in four figures himself to make sure it went off without a hitch for HHA residents. Others in the community joined Stuiver in backing the event including the mayor's family helping bring a positive event to HHA residents leading into Thanksgiving. What led to Stuiver no longer sponsoring the annual HHA Thanksgiving Dinner? MSV believes it began with this story last February, "Sign of the Times: Thugging it out at the HHA meeting." 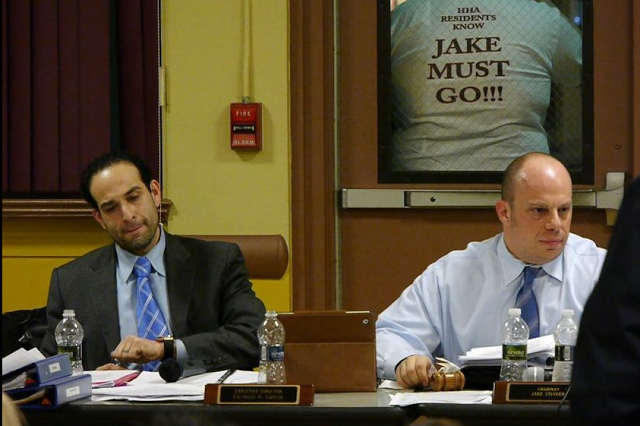 At that meeting, an all out personal assault would take place with the Carmelitos screaming at Stuiver during the meeting and speakers taking to the microphone to personally attack him, some wearing newly crafted "Benedict Jake" t-shirts handed out by Beth Mason political operative Matt Calicchio. What was the crime of "the traitor?" As acting Chairman of the HHA, Stuiver had attempted to see a vote of the HHA board to rotate new professionals into the roles of auditor and legal counsel, a change Carmelo Garcia did not approve. So while the annual HHA Thanksgiving dinner will not happen, another resident gathering was recently held to "honor" Carmelo Garcia for working in the aftermath of Hurricane Sandy by the Garcia backed HHA tenant groups. What people may not know is Garcia had planned to be out of dodge and skip town but was talked out of leaving for one of his numerous "conferences" by a HHA commissioner who questioned how he could do so with a hurricane approaching. The HHA commissioner who posited the question how could Garcia be planning to leave with Hurricane Sandy bearing down? Beth Mason political operative Matt Calicchio strategically positions himself on the outside of a door window posing with a "Benedict Jake" t-shirt reading "JAKE MUST GO!!!" at a February HHA meeting. Stuiver who was HHA Chairman sought to rotate new professionals into the roles of auditor and HHA counsel against the wishes of Carmelo Garcia. Talking Ed Note: If any HHA residents are wondering why there's no scheduled Thanksgiving dinner, they can thank the backers of Carmelo Garcia. Hey Joe, let the Carmelitos eat "Benedict Jake" t-shirts. Update: MSV has been emailed there was a HHA Thanksgiving dinner yesterday but the request for who paid for it from the source has gone unanswered. So, it appears yet another dinner featuring self-congratulaory accolades and speeches from Carmelo Garcia no doubt! As this story indicated, the Jake Stuiver privately funded dinner has ended. MSV has asked the source if there were Fidel Castro length speeches by Carmelo Garcia but that too has gone unanswered. Make of that what you wish. Update 2: A dinner was also held at Fox Hills. According to one unconfirmed source, desserts were provided by PSE&G. They received no credit for their generosity to Hoboken seniors. The source says PSE&G were never mentioned and in their place Mr. Carmelo "took credit for those desserts" and never recognized the true donor, concluding of the whole affair, "Shameful!" The real question, is anyone surprised by this coming from Hoboken's singular "Ethic Cleanser?"